There is a direct relationship between the temperature of returning condensate and the maximum vacuum that can be achieved with a vacuum pump. The chart below illustrates this relationship. The upper curve, CURVE II, shows the flash point. This is the maximum theoretical vacuum that can be achieved in the presence of water at a given temperature. 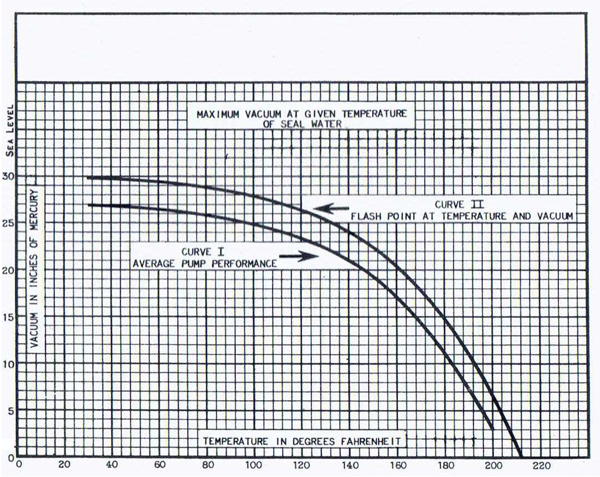 The lower curve, CURVE I, shows the maximum average vacuum that can be achieved with a liquid ring type vacuum pump at a given temperature. Our own field experience has shown that with a liquid ring type vacuum pump, the maximum vacuum will track the flash point curve, minus about 5″ Hg. vacuum. Some tests done in the late 1980s showed that a certain water jet type vacuum pump performed somewhat poorer at elevated condensate temperature than the positive displacement liquid ring type. What this means for the operator of a vacuum return steam heating system is that best vacuum performance requires the lowest possible condensate temperature. We have seen condensate returning at 90 degrees F. on a high vacuum, sub-atmospheric system, but as a practical matter, we would like to see 130/140 degree F. returning condensate temperature. Typically, we tell customers that if the condensate temperature is in the 175/180 degree F range, it will be very difficult to produce a vacuum until the leaking steam traps are repaired and the condensate temperature is brought down to 130/140 degree F range. We also suggest that one way to reduce the condensate temperature is to reduce the steam pressure at the boiler. Lower steam pressure equals a lower AMOUNT of steam produced, which means there is less steam to condense. It follows that there is also less steam leaking past the bad trap(s), and this results in a lower condensate temperature, which allows the vacuum pump to pull out to a higher vacuum. This higher return line vacuum can offset the lowered steam pressure on the supply side. Keep in mind that if a system was originally designed as a vacuum return system, the operating efficiency will be less when the vacuum is no longer present. This can mean as much as a 20/30% difference in fuel cost.